Manipur Assembly polls: Irom Sharmila is contesting against Chief Minister Ibobi Singh from Thoubal. 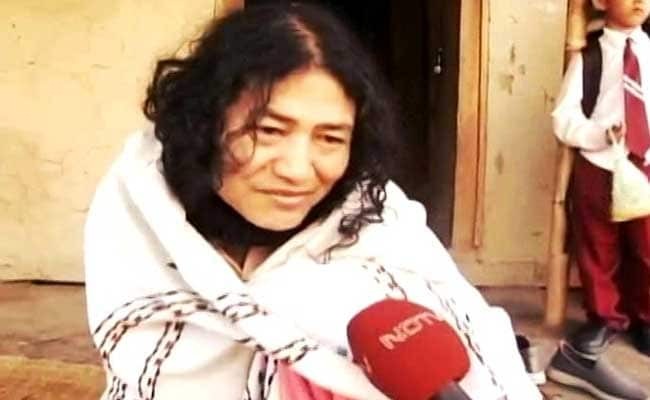 Irom Sharmila Chanu, the activist who ended an iconic 16-year fast to debut in politics and contest the Manipur election, said if defeated, she would try again -- in the 2019 national election. "I do not feel much affected by the result because people are yet to be given a chance... Everybody knows muscle and money power are openly used," Irom Sharmila said on Friday, hours ahead of counting of votes in Manipur. The 44-year-old has challenged Chief Minister Okram Ibobi Singh from his stronghold Thoubal -- a battle that is drawing eyeballs in the state. Her fledgling party, PRJA (Peoples' Resurgence and Justice Alliance), has the support of the Left and Arvind Kejriwal's Aam Aadmi Party. Mr Singh has dismissed her challenge. Ms Sharmila had to face the anger of the people after stopping her 16-year fast last year. Ms Sharmila said she wanted to take the political route to continue her agitation against the Armed Forces' Special Powers Act or AFSPA -- a claim that had failed to convince a large section of people who had supported her agitation. Ms Sharmila's claim that the BJP had offered to finance her campaign with Central funds -- a hefty Rs 36 crore -- had triggered controversy in the run-up to the elections. The BJP had demanded that that she prove her claims or face a defamation case. Mr Singh's Congress has alleged that the BJP offer shows how the party is trying to poach people with money power. Ms Sharmila had told NDTV that the people's reaction has been mixed. "They come to realise the real me... they come to know about my sense of humanity," she had said. In Thoubal, the locals had been "happy about my new step", she had said, adding, "They all want to see a change and they are fed up with the three term of the Congress." Chief Electoral Officer V K Dewangan has told reporters that results from Thoubal will take more time compared to Chandel, Jiribam, Senapati and Kangpokpi constituencies.